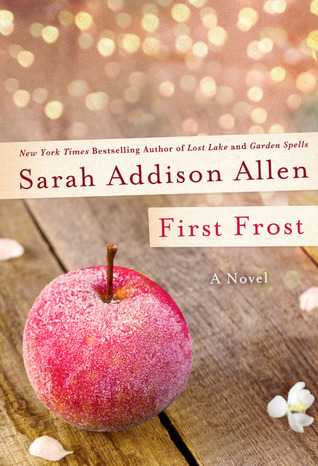 First Frost is another story about the Waverley family, we first met them in Garden Spells. It is over four years since I read Garden Spells so I was a little hazy. However I wasn't long into the book when I was remembering Claire and Sydney, the Waverley house, their families and that apple tree! They are all a little older and perhaps a little wiser. Claire has abandoned her cooking and now makes candies that are sent all over the country. It is a lot of hard work and she is somewhat out of sorts with herself. Sydney who can do magical things with hair now has her fifteen old daughter growing up and wanting to connect with Josh whom she feels she belongs with. That's Bay's gift she just knows what belongs with what. Sydney does not want Bay to be deeply hurt as she was as a young girl in a relationship, so she goes to great lengths to keep Bay and Josh apart. Sydney also longs for another child and in the meantime she enjoys Charlie, the small son of Violet the young woman who is the receptionist at the salon. While Violet is irresponsible Sydney sees something of herself in her at that age and wants to support her. The Waverleys are unsettled, things are afoot as they wait for first frost, when the apple tree will blossom. Into the mix arrives a strange, mysterious old man, he is there one minute and disappearing the next. What does he intend and why is he here? Whatever about anyone else, Anne at the inn where he stays, sees something in him that she longs for and may just push him who knows where! In that time before first frost, things go a little awry for Claire, Sydney and Bay. There are times of discomfort and longing, pain and anxiety. But the men married to Claire and Sydney love them and accept them and just want to let them be who they are. And as first frost falls all is sorted and the warmth of love, friendship, magic and acceptance reigns as the tree once again blossoms and they are surrounded with joy, revelation and a readiness to move into a promising future. I enjoyed my trip back to Bascom and I hope that a little down the road we might visit again this eccentric and magical family. I enjoyed your review Kathryn. This sounds like a very creative story. I enjoyed Lost Lake by Addison, but haven't read any other books by her yet. Thanks Pat. If you decide to read more of her, read Garden Spells first. I loved Lost Lake too. I was late coming to Sarah's books, but caught up quickly and look forward to reading this book. I've read some of hers. Fortunately I had read Garden Spells though! Lovely review Kathryn, there's just something about SAA's books that take me back to childhood, fairies and magical things! I think you are so right! I really liked this one, my review is scheduled for next week. I had not read Garden Spells, but I didn't feel that it impacted my enjoyment of the story at all. No I don't think it would matter if someone hadn't read Garden Spells, although I am happy to have read it first, but this one does stand alone as well.